A colorful new children’s park opened at the Los Angeles Zoo and Botanical Gardens March 3 thanks to a generous $250,000 donation to the Greater Los Angeles Zoo Association (GLAZA) by prominent attorney Neil L. Papiano…. [The park] incorporates animal-themed climbing sculptures, large play structures, a toddler area, water misters, grassy landscaping, and a large picnic area, is accessible to all children visiting the Zoo, including those with medical and physical challenges. My 6 year old daughter went to the LA Zoo on a field trip this week. She had a great time! Robert how cool of you to post this (seeing as I work at the zoo). The new playpark is definitely a big hit. 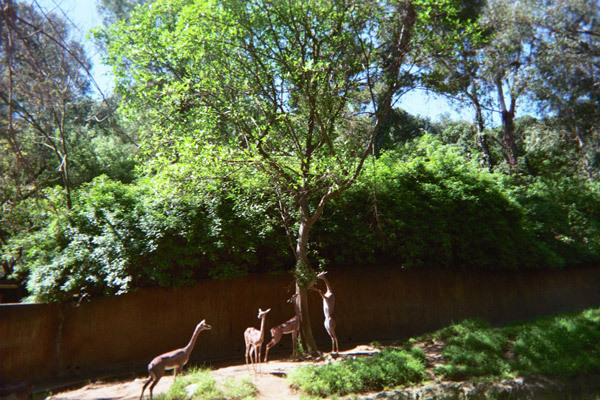 And Michael, that’s an awesome picture your daughter got of our gerenuk ( I like to call them giraffe-elopes). Next PostNext So, any news on those Hollywood Surveillance Cameras?